Three Billboards Outside Ebbing, Missouri is a 2017 crime drama film written, directed, and produced by Martin McDonagh. 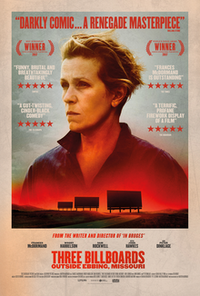 It stars Frances McDormand as a mother who rents three billboards to call attention to her daughter's unsolved murder. Woody Harrelson, Sam Rockwell, John Hawkes, and Peter Dinklage appear in supporting roles. It was released in the United States in November 2017 and in the United Kingdom in January 2018 by Fox Searchlight Pictures and grossed $159 million worldwide. At the 90th Academy Awards, Three Billboards Outside Ebbing, Missouri was nominated for seven awards and won Best Actress (McDormand) and Best Supporting Actor (Rockwell). At the 75th Golden Globe Awards, it won Best Motion Picture - Drama, Best Actress - Drama (McDormand), Best Supporting Actor (Rockwell), and Best Screenplay. It won three SAG Awards, including Outstanding Performance by a Cast in a Motion Picture, and five BAFTA Film Awards, including Best Film and Outstanding British Film. This webpage uses material from the Wikipedia article "Three_Billboards_Outside_Ebbing%2C_Missouri" and is licensed under the GNU Free Documentation License. Reality TV World is not responsible for any errors or omissions the Wikipedia article may contain.